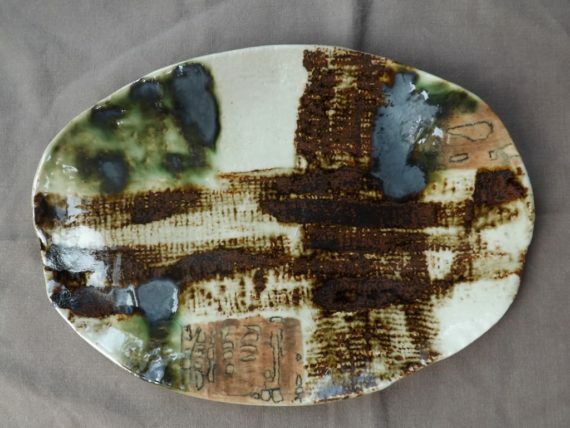 Before my first session with mentor, Jill Ford, I had an artist’s day out to Centre of Ceramic Art at York Art Gallery where the have a national collection of ceramics and British studio pottery in particular. 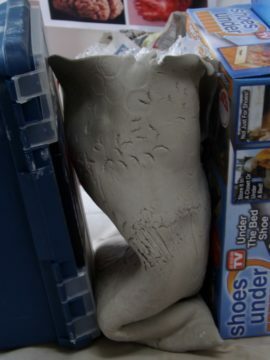 My work to date has been more about the textures and decoration but I became excited by form and volume that day. 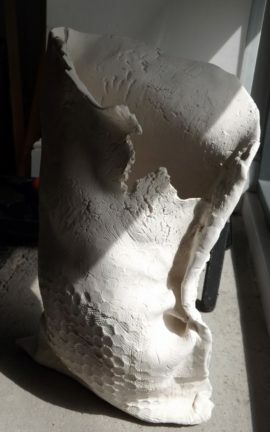 I wanted to recreate forms with internal space and weight that are muscular and visceral.I’m not working toward a particular show or exhibition at the moment so have had some time to explore this idea in clay and what has emerged is the baggy pot. 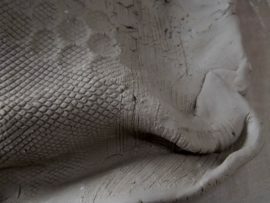 I texture wet clay, form and seal the pot shape then allow it to sink down into it’s base – gravity does most of the work. The joy of discovering the movement of the clay when not trying to control it and mould it into a pre-conceived shape is lovely. 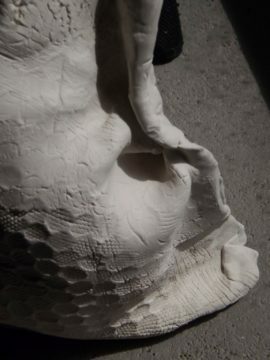 I find myself loving the rips and tears that appear when wet, textured clay, form and gravity interact to make these shapes that mimic internal body structures. It’s no coincidence that I have several conditions going on that make me very aware of the jumble of my innards. I am externalising something about my inner bodily processes but also discovering new things about my medium about following it’s natural qualities. This very different to the work I will be doing with Jill which is much more technical and controlled – but can still apply those skills of glazing and firing to my pots however baggy they get.